NOTICE: This is a decorative article, not a toy or intended for use by a child under 14. This triangle sports pennant is outlined in green with orange letters; has a half a football standing out on the long side of the triangle; in bold white letters above the football is “TOUCHDOWN!” and under the football it reads “GO TEAM” in bold white letters; down the pennant in bold orange letters it reads “FOOTBALL” with the F the largest letter and decreasing in size as it goes down the pennant; it has a green background; there are two silver stars at the vertex of the pennant; hanging under the pennant is a football and white helmet. 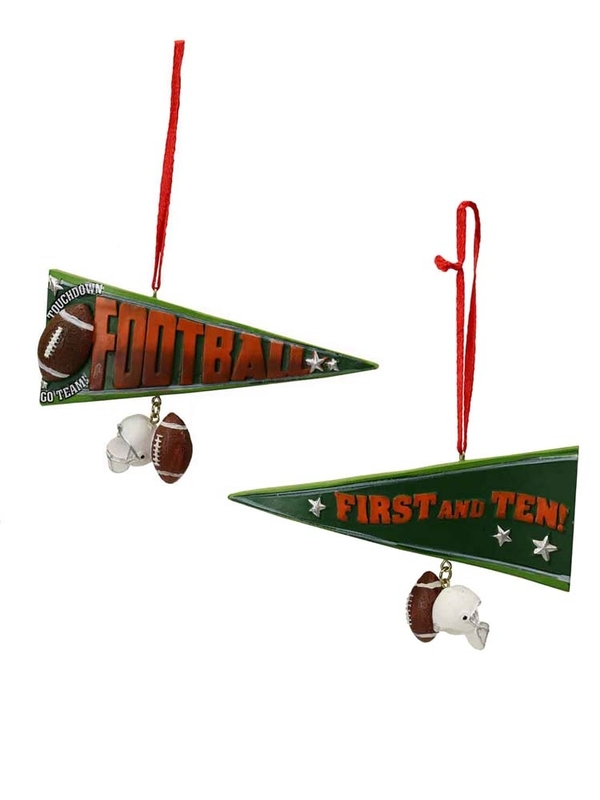 On the back of the pennant is the green outline with darker green background with a silver star then “FIRST AND TEN!” in bold orange letters and two silver stars under the “ten!”; the back of the football and helmet dangle below the pannant. The ornament hangs on a red ribbon about 3.5 inches long. The ornament is made of resin. Height 3 inch, Width 4.75 inch, Depth 1 inch.